Some frequent search terms used by visitors to this site are Blavatsky and Maitreya, Theosophy Maitreya, and What did Blavatsky say about Maitreya? Since so many people have apparently been wondering and asking, it was thought wise to produce this article specifically on the subject. It may come as a surprise to some but H. P. Blavatsky actually said very little about Maitreya. The emphasis in the Theosophical Movement on Maitreya did not begin until 1909, 18 years after Blavatsky’s death. This emphasis and focus was begun by a highly controversial English Theosophist named C. W. Leadbeater. In 1906, Leadbeater had been forced out of “The Theosophical Society – Adyar” in shame and disgrace after admitting under oath to having performed sexual acts on young boys in his care. However, only a couple of years later, Annie Besant – who was soon to become the president of the Theosophical Society – invited Leadbeater back and readmitted him, much to the shock and disgust of many members. That Leadbeater never reformed his ways is apparent from the mass of accusations, eyewitness reports, complaints, court cases, and police investigations that continued to hound the rest of his Theosophical career around the world up to his death in 1934. His lifelong sexual obsession and abuse of boys has been well documented in many places, particularly in Gregory Tillett’s lengthy biographical study “The Elder Brother: A Biography of Charles Webster Leadbeater” and in this document containing verbatim legal transcripts, court reports, confessions, and graphic letters written by Leadbeater to boy proteges, at http://blavatskyarchives.com/ton2.pdf. More information, for those who can stomach it, can be found in our articles The “Etheric” Body Does Not Exist and The Case against C. W. Leadbeater. In 1909, soon after having been readmitted and raised to a place of prominence by Besant, Leadbeater claimed that he had discovered via his supposed clairvoyant and spiritual powers that the coming of Maitreya was imminent. Now it must be explained that the “Coming of Maitreya” is initially a Buddhist doctrine. It is said that Gautama Buddha stated that the next Buddha would come 5,000 years after him and would be called or referred to by the Indian name of Maitreya. Since Gautama lived 2,600 years ago, this would mean that the Buddha Maitreya is not due to appear on the scene until another 2,400 years from now. But Leadbeater claimed that Maitreya was first of all going to appear as a Bodhisattva and World Teacher and then sometime later on would succeed Gautama as the Buddha. Even more surprisingly, he announced that Christ and Maitreya are one and the same person. According to him, this being – who he called the “Christ-Maitreya” or “Lord Maitreya the Christ” – was a highly advanced soul living in a physical body here on the physical plane, somewhere in the Himalayas, and that he had spiritually overshadowed and worked through “the Master Jesus” during the three years of the latter’s public ministry. Thus, according to this line of thought, Jesus and Christ are two distinct beings. Apparently unperturbed by or oblivious to the fact that equating Maitreya with Christ is offensive to the majority of both Buddhists and Christians, Leadbeater declared that the coming of Maitreya – or, in other words, the Second Coming of Christ – was near and that he was intending to make his reappearance on the world scene by means of overshadowing another individual, this time a young Indian man called Jiddu Krishnamurti who Leadbeater had seen playing on the beach near Theosophical Society headquarters in Adyar, India, one day and taken a shine to. Much to the distress of Krishnamurti’s father – who considered Leadbeater to be a predatory menace and corrupting influence towards all young boys – Leadbeater and Besant eventually managed to seize custody of the boy and the next twenty years were spent carefully grooming and training him – some might instead be inclined to call it brainwashing – for his eventual “mission.” For further details of this period, see Tillett’s book or any in depth biographies of Krishnamurti. But by this time a relatively large number of Theosophists, realising that Leadbeater was either a conscious fraud or just highly deluded, had stopped paying attention and giving credence to his various schemes and the idea never got off the ground. Several years after the 1909 announcement, a devout Christian woman from England named Alice Bailey joined the Adyar Theosophical Society and began enthusiastically studying and accepting Leadbeater and Besant’s teachings. A few years later, however, she parted company with the Theosophists and began her own organisation, known as the Lucis Trust and the Arcane School. Over the course of thirty years she wrote and published over twenty books, almost all of which she claimed to have been directly inspired and dictated by a Tibetan Master called Djwhal Khul. Just as Besant and Leadbeater had chosen years previously to reject, discard, and suppress the original Theosophy teachings of H. P. Blavatsky and to present their own instead, the version of “Theosophy” found in the Alice Bailey books is pure Leadbeater/Besant stuff and contradicts all the Blavatsky teachings at almost every point, having next to nothing in common with them. For more details in this regard, please see the articles 14 Good Reasons to reject the Alice Bailey Teachings, The Pseudo-Occultism of Alice Bailey, Original Theosophy and Later Versions, and the very lengthy but extremely detailed and conclusive Tibetan Master or Christian Priest? From her very first book, Bailey showed her faith in Leadbeater by promulgating the teaching that the Second Coming of the Christ-Maitreya was close at hand. Always written in a distinctly Christian tone, Bailey’s books developed an increasing emphasis on this theme until by the time of her death in 1949 she was writing about little else. She informed her readers that Maitreya had made a definite decision at the Gemini Full Moon of 1945 to reappear publicly on the world scene in person as soon as the necessary preparations could be made. Although Bailey – who readily admitted of her own accord that she was a committed Christian – naturally preferred the name “Christ” to “Maitreya” and thus referred to him in many of her books solely as “Christ,” she nevertheless made it clear that she agreed entirely with Leadbeater about Christ and Maitreya being one and the same. Over the last few decades numerous individuals have come and gone, all claiming to be Maitreya, just as many pretenders have come and gone throughout history claiming to be Jesus. At the same time, the Alice Bailey followers and other pseudo-Theosophists continue to spread their Leadbeater-esque teachings, whilst Alice Bailey enthusiast Benjamin Creme in London assures his large international following that the Christ-Maitreya has already returned and has been living secretly in London since 1977, waiting patiently (when not flying around in his “special starship”) for the day when he can at last reveal himself to the world. Meanwhile, hundreds if not thousands of channelling enthusiasts flood the internet daily with what they announce as being the “latest messages” – all contradicting each other – fresh from Maitreya, for whom each of them claims to be the chosen mouthpiece. All this nonsense, this sheer fantasy and psychic delusion, goes directly back to C. W. Leadbeater, a man who has done more harm to the cause of modern spirituality than many have yet realised. We have provided this overview of the whole affair in order to show by contrast just how extremely different are the genuine Theosophical teachings on Maitreya from this later material. Before we look at the little that H. P. Blavatsky had to say about Maitreya, we should clarify that the particular Theosophical Society which was ruled by Besant and Leadbeater is actually only ¼ of the entire Theosophical Movement at large. It is more correct to refer to that particular organisation as the Adyar Theosophical Society in order to avoid giving the impression that it is THE Theosophical Society. In fact there are three entirely different and unrelated international organisations called “The Theosophical Society.” One of them has its headquarters at Adyar in India whilst another has its headquarters at Pasadena, California and the other, formerly based at Point Loma, California, has its headquarters presently in the Netherlands. There is also the United Lodge of Theosophists, itself a worldwide association. Of these four main branches of the Theosophical Movement, it is only the Adyar Society which accepts the Leadbeater/Besant teachings; the other three have nothing to do with them and have remained true to H. P. Blavatsky and William Quan Judge. For a brief overview of these organisations and the distinctions between them, please see The Four Branches of the Theosophical Movement. In Tibetan Buddhist tradition, it is always said that Aryasangha had a close connection with the future Buddha Maitreya and that during his periods of intense meditation he rose to other realms and there received special teachings from Maitreya which he later recorded in five main books known as the “Five Books of Maitreya.” As we said in the article Buddha Nature, one of these books – the Uttara Tantra or Ratnagotravibhaga, which has recently been translated and published in English – is a particular favourite with the Masters. But there is also a secret Book of Maitreya referred to by HPB, which she made use of (as she wrote to A. P. Sinnett) when writing “The Secret Doctrine” with the Master K.H. and the Master M.
And that sums up everything H. P. Blavatsky ever said and taught about Maitreya. And the present day students of H. P. Blavatsky are determined to do the same, ready to fight for genuine Theosophy to their very last breath if need be, regardless of how many of “the pretenders” and “weak-minded dupes” it may offend. Why Stick To The Original? There are quotes from HPB about the return og the Christ, and the preparations needed before that can happen. She does not say “Christ” but the coming one. Thank you for your comment but your statement is incorrect. Can you provide references or sources for such “quotes from HPB”? I can assure you that such quotes do not exist. It sounds as if you may be attributing things by Alice Bailey to HPB. Bailey wrote at length about the return of the Christ and often using the phrase “the Coming One.” But as this article and others show, that is completely antithetical to the teachings of HPB and the Masters. Some related articles which may be of interest in this regard are “14 Good Reasons to reject the Alice Bailey Teachings” (https://blavatskytheosophy.com/14-good-reasons-to-reject-the-alice-bailey-teachings/), “Alice Bailey and her Christianised Pseudo-Theosophy” (https://blavatskytheosophy.com/alice-bailey-and-her-christianised-pseudo-theosophy/), and “Christos – The Christ Principle” (https://blavatskytheosophy.com/christos-the-christ-principle/). Well, I can find them, but I need time (my old PC with the data crashed). But I can quote them from av video I have from one of the few persons who have, like myself made a comparative study of H.P.B, A.A.B and Leadbeatter. All who have done a deep study of those three have come to the same conclution. There is no discontinuity between them. Regarding Leadbetter, there is a lot of mistakes in his works (f.ex the mars, mercury, earth issue), because they were not dictated by DK, but he only helped him and let him make mistakes. Regarding DK as being the source of H.P.B, is only partially true, he did provide som of the info, but what he did was to manifest the thought forms M and KH prepared for the SD to H.P.B. So it is relative. M said somewere in the mahatma letters that the the only thing he needed to do was to smoke his pipe, and put DK to do the rest of the work. It seems that that was the way they normally worked together. Where is this “somewhere”? Can you find a page number or reference for this? There is no such statement in the book but many students, although sincere, conveniently misremember things in order to suit their own personal views and preferences. The purpose of the present article is simply to present a number of important statements from the Mahatmas – Masters of Wisdom – relating to the true authorship of that book. It was not merely written by HPB herself, nor was it inspired or dictated to her by a chela of the Master Koot Hoomi known as Djwhal Khul, as has been falsely asserted by certain individuals. Djwhal Khul or D.K. was only a chela (disciple) “of the first degree” according to both HPB and Damodar K. Mavalankar and thus not a Master. He did not even take his very first initiation until the 1880s (see “Damodar and the Pioneers of the Theosophical Movement” p. 202 and “The Letters of H.P. Blavatsky to A.P. Sinnett” p. 12). He did not dictate any books or writings of HPB or anyone else. This is just a lie – one of many – of Alice Bailey, who claimed that “The Secret Doctrine” had been dictated to HPB by D.K. – who she claimed was her own inspirer – so as to then be able to “correct” and “revise” (i.e. distort, misquote, mangle, and suppress) the teachings of “The Secret Doctrine” in her own books, purportedly on the authority of the same Master. The idea that Djwhal Khul worked closely with HPB in her writings has no basis whatsoever in anything other than the unsubstantiated assertions of later writers, who began making such statements long after HPB had passed away. If you read “Who Wrote The Secret Doctrine?” along with “14 Good Reasons to reject the Alice Bailey Teachings” (https://blavatskytheosophy.com/14-good-reasons-to-reject-the-alice-bailey-teachings/), “The Unavoidable Facts about C.W. Leadbeater” (https://blavatskytheosophy.com/the-unavoidable-facts-about-c-w-leadbeater/), “Original Theosophy and Later Versions” (https://blavatskytheosophy.com/original-theosophy-and-later-versions/), “The Theosophical Movement after H.P. Blavatsky” (https://blavatskytheosophy.com/the-theosophical-movement-after-h-p-blavatsky/), “The Closing Cycle” (https://blavatskytheosophy.com/the-closing-cycle/), and “Why Stick To The Original?” (https://blavatskytheosophy.com/why-stick-to-the-original/) – and still maintain that “There is no discontinuity between them” then I’m inclined to think that there’s very little point in us continuing this discussion. You say that you “need time” to find the quotes from HPB about the return of “The Coming One” and about the necessary preparations for this. Please take your time and we’ll be looking forward to seeing such quotes, which need to be properly referenced (book title, page number, or article name) and legitimately quoted (i.e. not distorted, abbreviated, or edited in any way) in order for anyone at all to consider them to be genuine. I have a feeling we might be waiting quite some time, since it’s not easy to find things that don’t exist. Yes, you will have to wait for some time, I will not prioritize this as I have the feeling that regardless of the amount of proof, you will do as materialist do when presented with proof. But in the meantime what about this? Please do prioritize if you can, as such “proof” will be of monumental importance for the whole Theosophical world, seeing as all deep and genuine students of HPB have been unanimously and unwaveringly agreed for the past 100+ years that she never said, wrote, or taught anything along the lines you are talking about. I first read those two articles several years ago whilst still a committed Bailey student and actively involved in promoting her books and teachings. Like most Bailey students, I was enthusiastic about the “Tibetan Source” article and believed that it constituted proof or at least quasi-proof of the genuineness of the claims of authorship of the Bailey books. Only later, when I read it through properly, attentively, and with detachment, did I see that it provides no proof of any kind whatsoever, but merely one man’s speculation and opinion. An article like this could never stand up in a court of law but would be dismissed as meaningless and lacking in anything resembling any sense of definiteness. On the other hand, we have many clear, distinct, specific, unequivocal, statements from the writings of HPB, the Masters’ Letters, and William Q. Judge, which automatically invalidate – by implication – the Bailey teachings and show them to be the very antithesis of genuine Theosophy. All the relevant links to articles containing such quotes and references have already been included for you in my previous comments, so I’m not going to repeat them here. They are there if you want them. But if you choose not to look at them or to read them and then ignore them (as I myself used to do with such information, when I first began to realise that the Bailey teachings and Blavatsky teachings were incompatible), that’s entirely up to you and you are well within your rights. He fails to mention that it is also a well-known characteristic feature of Jesuit writings. There is far more reason to believe that Bailey’s unseen inspirer was a Jesuit or someone connected with the Jesuits than a Tibetan. But as you are a deep student of HPB, you don’t need me to remind you of all her and the Masters’ many important words and warnings regarding the Society of Jesus and its members or how the Master K.H. said that They have no hesitation in describing the Jesuits as the enemies of the human race. Strangely, Bailey and her “Tibetan” keep silent about the Jesuits, as did “Bishop” Leadbeater. But that too is no proof. But if you only read one of the above mentioned articles, let it be “Why Stick To The Original?” at https://blavatskytheosophy.com/why-stick-to-the-original/ and you will see some of the main reasons why an increasing number of people are abandoning the Bailey teachings (as well as those of Leadbeater/Besant and others of their ilk) in favour of the original Theosophical teachings, i.e. those of HPB and WQJ, the latter of whom you have left completely unmentioned so far for some reason. If you read that article and the quoted statements included, you will understand how even if the Bailey teachings were entirely in line with HPB’s teachings, they could still never be accepted as being legitimately from the Masters, due to the restrictions of cyclic law, which only allow further teachings to be given out during the closing 25 years of a century. If HPB, WQJ, and the Mahatmas, were ever clear and specific about anything, they were clear and specific about this. But as it is, the difference between the two systems is as the difference between daylight and dark. I will now say no more and wait patiently for the quotes and evidence you’ve promised to send. A new article has been written which really needs to be read by anyone who believes the Alice Bailey teachings to be something good or who considers them to be legitimately from the real Masters of the real Trans-Himalayan Brotherhood who were behind H.P. Blavatsky and her work. The article is very lengthy but it had to be in order to sufficiently expose all the relevant facts and information that reveal the deliberate deception and sinister motives at the heart of the Bailey books, the Lucis Trust, and other organisations or groups connected with or based upon it. It will not make comfortable reading for Bailey followers but if they truly believe that “There is no Religion higher than Truth” they will surely take the time and effort to read it through to the end and then respond according to their own conscience. To cling to teachings that were written over 130 years ago and not think that the teaching of the Masters will not continue to evolve through other disciples as we the New Age moves forward is to be stuck in sand. Alice Baily was an evolved disciple who worked with and through her Master DK. Not unlike HP and not unlike Mr Crème. It is such short sightedness for those who should know better to hold to teachings that served there purpose at one time and to disregard teachings from the same source (the Masters of Wisdom). 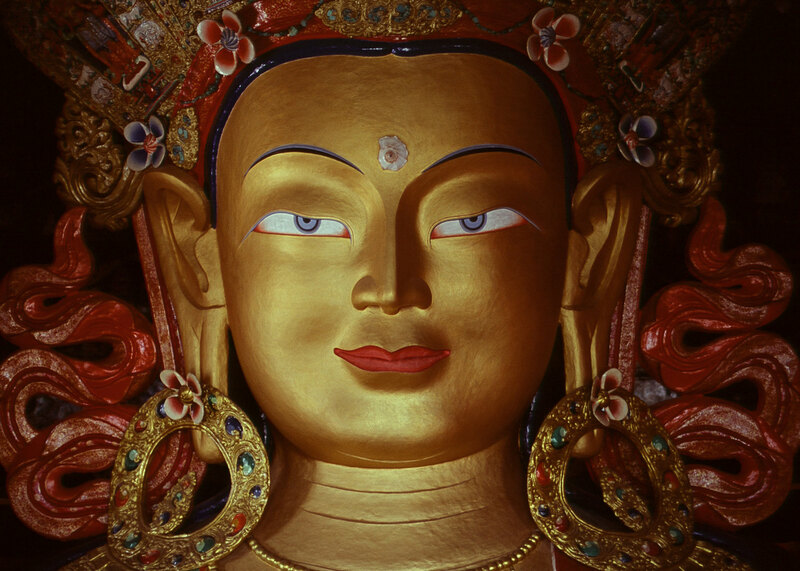 Maitreya is here (never left really) and has taken physical form in a mayavirupa and will be with us for many many years to come along with his fellow Masters. This is a fact. To those who doubt… try to have an open mind. It is not a matter of having an open mind…it’s a matter of facts and trustworthiness. The writer of these articles was initially a faithful student of the Bailey teachings himself until beginning to research into the facts and into the original Theosophical teachings and the very clear and unequivocal statements found therein from the Masters, HPB, and William Q. Judge. Numerous people around the world have given up the Bailey/Leadbeater/Besant teachings in favour of genuine Theosophy after reading these articles. As stated above, you can find answers with specific quotations and references in the much lengthier article “Tibetan Master or Christian Priest? (Uncovering the real inspiration behind the Alice Bailey Books)” at https://blavatskytheosophy.com/tibetan-master-or-christian-priest/. Personally, the fact that Leadbeater was a sexual predator and Bailey willingly took a blind eye to this is quite enough reason to discredit them. How can a learned occultist and/or disciple of high spiritual grade be a victim of his own perverse sexuality, and how does another so called disciple ignore such a major personality fault? I doubt a spiritual master would choose a deluded child molester and his enabler to be the vehicles of great spiritual truths for the masses. Thank you for sharing this quote Patrick. However, as you’re most probably aware, all of the quotes and statements from HPB on any given subject have to be taken together in order to arrive clearly and accurately at the understanding of what she actually said and taught.